A deep cyclone will develop west of the British Isles and Ireland, passing across the region into the North Sea and push into central Europe. Models agree the cyclone will be considerably deep, with central pressure likely dropping to 970-980 mbar. 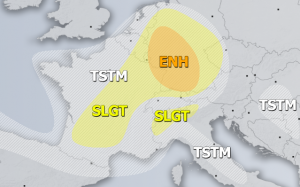 It will cause severe to extremely severe winds across the British Isles, Ireland, parts of France, BeNeLux and France. Position of the cyclone on Saturday and Sunday. Map: Wxcharts.eu. The low rapidly deepened overnight to Saturday, while approaching Scotland. By 08h UTC central MSLP reached 987 mbar. Models agree the low will pass over Scotland into the North Sea by late on Saturday, where it will likely rapidly deepen further to below 980 mbar. Severe winds, gusting up to 100-120 km/h are expected across parts of the British Isles and Ireland, particularly the coastal areas and higher elevations. Also expect severe winds, gusting up to 90-110 km/h along the coast of NW France (Bretagne). Particularly severe winds are expected to develop over the western North Sea, off the eastern coast of Scotland and England and into the coastal area of BeNeLux on Sunday. The effects on the coast critically depend on the position and track of the cyclone across the North Sea. Models generally agree wind gusts will reach 140-160 km/h. Peak wind gusts across the region through early on Monday. ARPEGE and ICON-EU model guidance. Map: Wxcharts.eu. Also expect considerable snowfall across much of Scotland, with up to 10-20 cm of fresh snow. Total snowfall across the British Isles and Ireland by early on Monday. ARPEGE and ICON-EU model guidance. Map: Wxcharts.eu. Keep alert in all mentioned areas for severe to extremely severe winds and associated potential threats. Peak wind gusts across the region over the weekend.ICON-EU model guidance. Map: Wxcharts.eu.